I Love the Asheboro Zoo! I love to go to our Asheboro Zoo, in Asheboro, North Carolina. At least once a year I go with my friends to see what’s new or what we may have missed on the last trip. But I also enjoy the old favorite animals. The zoo covers 500 acres with five miles of pathways covering multiple terrains for over 1600 animals and 52,000 plants. There is a lot to see there!! Various natural habitats for several different climates and zones of the world are represented here. One entrance leads you through an African village with gift shop, restaurants and then into the vast acreage of the Savannah, grassy plains with rhinoceroses, ostriches, and other antelope family animals. Zebras, a few ostriches and giraffes have their own section with plenty of trees and tall rocks where the caregivers can feed or take care of the giraffes. In both areas they wander around like it was home and seem quite content to do the things they would do in their home country: walk, run, eat, drink, ruminate and look around. The elephants have a large field with rocks to hide behind, mud bath areas, and ponds for them to bathe in. There is of course a large rocky cave with a wide open area for a pair of lions. I was able to go when their cubs came out of the cave and followed their mother. The other zoo entrance has a similar set up of gifts shops, restaurants and bathrooms but the theme here is the North American lands. On the way down the walkway into the park there is a huge lake with a bridge from which you can see lily pads, frogs, fish and other swampy vegetation. There are sloping walkways throughout the zoo for wheelchairs, strollers and rented motorized scooters. Huge alligator across the pond and behind glass looking straight at me! I love the aviary where so many beautiful exotic plants and dozens of exotic birds live. There are walkways through the vegetation where you may see birds eating, running, building a nest or flying over the trees. 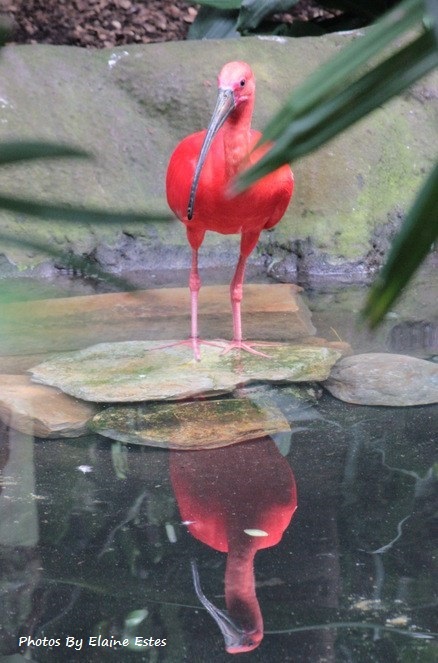 My favorite bird here is the Scarlet Ibis. There are so many things to see in the climate controlled humid area. There are orchids of different kinds, banana trees, and staghorn ferns and so much more. Two other areas I enjoy are the gorilla and chimpanzee lands. There are all kinds of trees fallen and standing with hills to climb and grassy plains for them to roam. Several baby gorillas have been born there. The wonderful part is you can see it all through a glass wall. The gorillas and chimpanzees can come right up to the window and look you in the eye, up close and personal. What an experience! 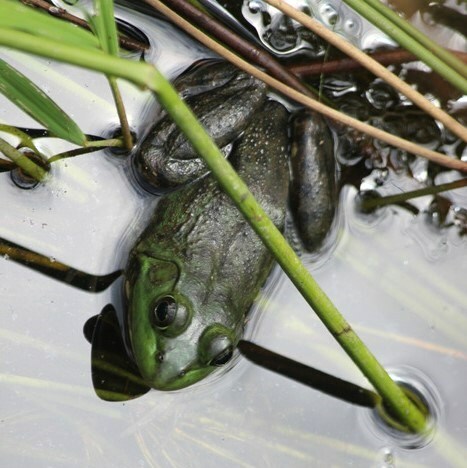 There are two main attractions close to the Wetlands of North America entrance. The harbor seals and the polar bears. They have their own separate areas of course but they have lots of room to swim, climb, hide out, stay cool and there are toys for the bear(s). The seals have frequent daily interactions with the care givers to keep them acclimated to being checked and fed. In between the two entrances are roaming fields for elk, elephants, bison, and more of the North American four legged wild life. There are felines too like ocelots, and smaller cat family members. There is also a central area for sitting down to eat, see 4 D shows for kids, a merry go round, and more. Along the pathways there are iron statues of animals you will find in the exhibit you are approaching. There are also air conditioned buildings strategically positioned along the meandering walkways. Where you may view live snakes, spiders, bugs and even venomous frogs, each safely behind glass in whatever temperature setting they require. One of the many niceties is transportation by vehicle pulled cars with open air seats that will take you from one large area to another when you need a break from all the walking. There are several rest stops with bathrooms, food and drinks too. There are cooling misters that you can stand under on hot days to refresh yourself under. This zoo is growing and is quite a delightful, educational experience! I recommend going before it gets too hot. 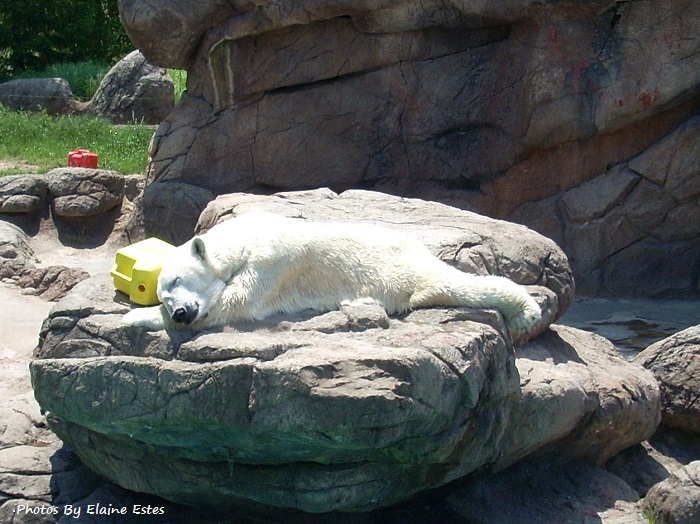 That’s when some animals stay in the shade to keep cool, but where you can’t see them as well. I can’t wait to see what will be there next time I go. Love reading your blog! I get busy sometimes so I miss my one here and there, but they do brighten my day and give me food for thought. Coleen, you just made my day!! Thank you so much, my friend! I still want to come see your beautiful home some day!! Thank you! It was my first challenge like this and I am proud of myself for rising to it! I did it!! Thank you so much!! Great ideas and new friends arose from it. Hope you enjoyed it too. Thank you so much! Delighted that you liked them!! You take wonderful photographs. Such a keen eye! I wish I could visit the zoo with you. Thank you kindly! So glad you liked my photos!! Sure, come down to NC and I’ll go with you!! You can stay with me! Great! Let me know when you go and I may be able to come meet you and your family! It is well worth seeing. So glad, I helped you make the decision!! I read the A to Z post sporadicly because I was still recuperating and did not keep up. But tonight I re read and they all I so enjoyed. You are so great in writing and your pictures are so beautiful.. I have no idea how to do a challenge but you really manage this one with ease. I enjoyed reading the entire context at once. I wonder if I could do some similar without a challenge. Wow! Thank you Gay Nell!! I am delighted that you enjoyed them so much!! Sure you can do anything you want to on your blog. Go for it! Pick a theme and do it. I would love to see what you come up with!! I would read yours too! Congratulations on making it to the end of the Challenge! 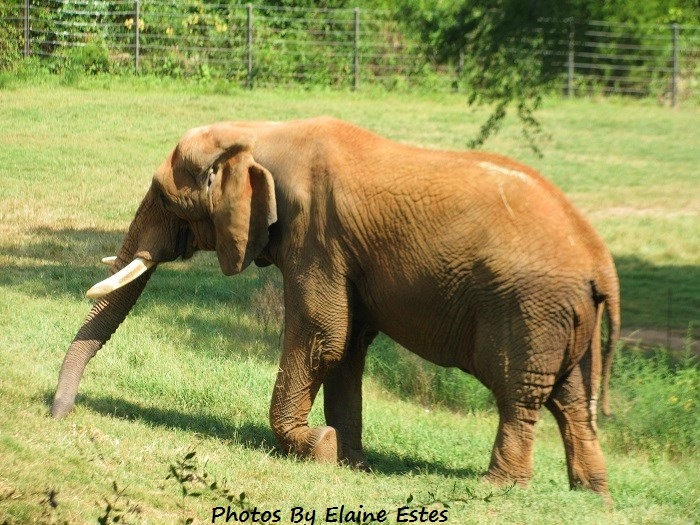 A lot of us wrote about zoos, but it’s a great subject for Z.
I couldn’t think of anything better to use for Z and especially after I have gone to the Asheboro Zoo almost every year for the last 7 years. They always have something interesting going on and there is just so much to see there. North Carolina is such a beautiful state anyway, I’ll bet the zoo is one of 5 star quality. I love that you can catch a ride to different areas of the zoo. This also tells me how spacious it is. I often wonder if the animals are being well cared for, and given ample room to flourish in such an environment. Seems so by your pictures. 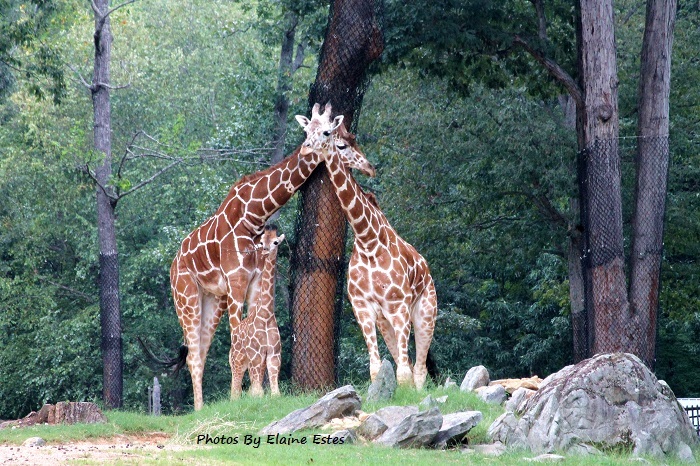 I especially like the giraffe image, because I see the baby giraffe standing with his/her proud parents. 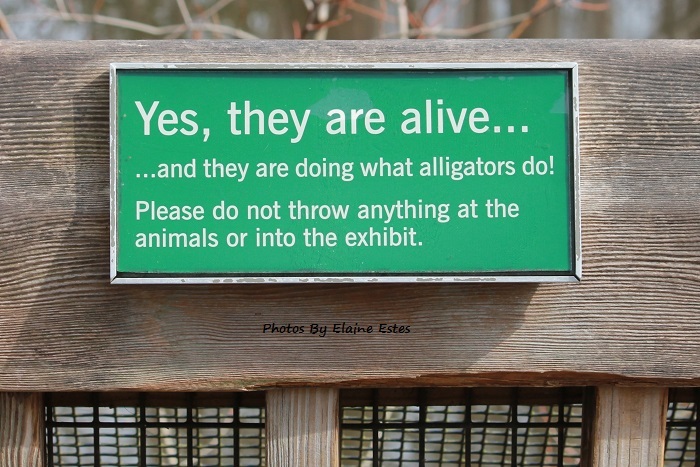 And no, I wouldn’t be fooled by the alligators. They are most likely practicing patience. If anything, I want to learn from them! Well, I never thought of learning patience from alligators! They were huge. The whole zoo is just incredible! I love animals and hate for them to be in cages. This zoo has more than a dozen different landscapes for each animals. Thank you for your comments.Hugs!! You are very welcome. Hugs! I visited the Melbourne zoo last week and they also has a giraffe family… amazed by how they can tell who is who for a giraffe as they all look the same! I never thought of that question. But now that you brought it to my attention, I wonder how zebras do too.Lol. Probably individual scents help them figure out who’s who. Wonderful photos. This looks like an excellent zoo with good space for the animals. Thank you, Anne. I didn’t even post some of the natural sites like a path with over reaching tall bamboo stalks or the unique sun bleached trunk of a dead tree. There was just too much beauty to capture it all. Delighted that you enjoyed the pictures and post!